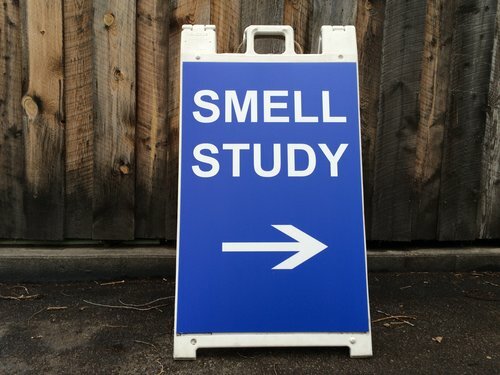 When I moved to Colorado in mid-2015, it occurred to me that there were two local olfactory opportunities that might be commercialized. One was cow manure, the other was pot. When the wind is right, the unmistakable scent of manure wafts over Fort Collins from large-scale cattle feedlots many miles to the east and south of town. Having grown up in California’s Central Valley, the smell of manure is, to me, familiar and not particularly disagreeable. But immediately downwind of feedlots it can be pretty intense, and the cattle industry is interested in cost-effective ways to reduce it. I did a literature search and concluded that the problem has not been adequately attacked from my point of view, i.e., as a the fragrance industry would tackle a new malodor issue. I think a combined chemical and psychophysical approach could yield commercial innovations. But the more alluring opportunity proved to be pot, newly legal in Colorado for recreational use and an industry that is growing at an exponential rate. I sniffed my way through the wares of local dispensaries and was amazed at the enormous olfactory range on display. Some strains reeked of grapefruit, others were dense and funky. Some were almost cheesy, others mildly hay-like or even piney. From a fragrance standpoint, there is at least as much going on in weed as there is in wine, beer, coffee, or tea. But there’s a big difference. Those other agricultural products have a long history of aesthetic appreciation. They have fully developed olfactory lexicons (think, for example, of the U.C. Davis Wine Aroma Wheel). And they have chemical standards and training programs. Cannabis, on the other hand, maintains an outdated, underground feel. Sure, there are aficionados who can be eloquent in describing the aroma of a given strain. But there is no organized, empirically-based, agreed-upon basis for describing the scent of weed. For example, in the various “Cannabis Cup” competitions, smell is one of many dimensions on which a strain is judged, but as far as I can tell there are no specific criteria for evaluating a sample’s smell. If sheep or chickens were judged that subjectively at the county fair, there would be a riot in the livestock pavilion. By this point I had landed on a simple idea—to treat locally available cannabis strains as a just another consumer product. 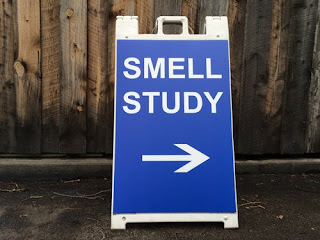 I would do routine sensory research to characterize the relevant odor descriptors, and see whether consumers could tell one strain from another based on smell. That was my original idea. To make it happen, I had to blaze my own trail. I found an angel investor and created a new company: Headspace Sensory LLC. I wrote an entire research plan and got it approved by an independent institutional review board. I found an excellent collaborator in Joseph DiVerdi, a Colorado State chemistry professor with an interest in cannabis and his own private lab. With his help I found a genial landlord willing to rent me a couple of rooms perfect for sniff testing. All the elements were in place. But I still needed to find volunteer sniffers. That would prove harder than I had imagined.